Hard water can cause scaling, deposits inside of pipes, reduced cleaning ability, and several other problems. Home ownership opens people’s eyes to many new experiences, even requiring homeowners to familiarize themselves with certain things they never encountered as renters. Homeowners become novice plumbers, electricians, horticulturists, and even chemists as they wade through the projects and repairs involved with owning a home. Outside of high school chemistry class, you may never have given thought to water composition and how it changes. However, once you become a homeowner, you may have to pay special attention to the type of water bubbling out of your faucets. Hard water is a common concern, and it can affect appliances and other parts of the home. Hard water affects about 85 percent of the United States, according to the Water Quality Association. Although not harmful to human health, hard water can impact one’s daily life in other ways. Hard water is formed when water moves through soil and rock. It dissolves very small amounts of minerals and holds them in a solution. Calcium and magnesium are the most common minerals to turn water “hard.” The more magnesium and calcium water dissolves, the harder it becomes. Hard water can not only be a minor headache, but also something more serious. Hard water can interfere with various cleaning tasks and also personal grooming. Clothes washed in hard water may not be fully clean and may appear dingy. Hard water can cause a film on surfaces, such as bath tiles and tubs. Some people find that their hair and skin can appear dull and sticky due to hard water. Hard water can have other effects, too. Over time, the water can deposit minerals on the inside of pipes, reducing water flow. If these deposits grow thick, you may have a plumbing issue on your hands. Furthermore, mineral deposits can harm appliances, such as water heaters, washing machines and dishwashers. Eventually, hard water may render these appliances ineffective, and they will need to be replaced. 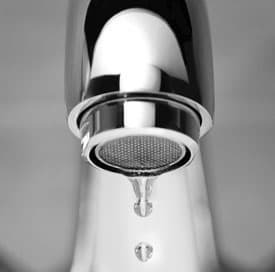 Considering hard water is such a common concern, a number of treatment options exist. The main types of water-softening systems use either a packaged water softener or a mechanical water-softening unit. Packaged water softeners are chemicals that bond with the calcium and magnesium ions in the water so that they cannot interfere with cleaning efficiency. These chemicals fall into two categories: precipitating and non-precipitating. Precipitating softeners are borax and washing soda and can affect pH levels of water and make water cloudy. Non-precipitating softeners use phosphates. Alkalinity won’t be increased, and usually there is no cloudiness or buildup. These products are typically added to laundry loads and the like and are not recommended for drinking water. Mechanical water-softening systems are hooked up directly to the plumbing of the house. They are ion-exchange systems that will add salt to the water. Although it can be safe to drink, softened water may not be recommended for those who are on low-sodium diets. Hard water is a problem many homeowners have to face. It can affect a home’s appliances’ performance and cleaning abilities. Water hardness can be managed, and it is best to consult with an expert water-softening system manufacturer about your options.